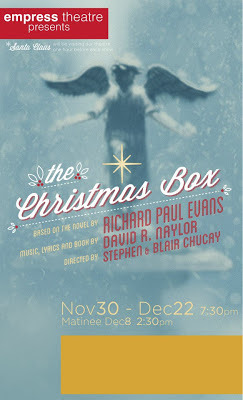 Last Friday night we went to the opening night of "The Christmas Box" at The Empress Theatre. It was the perfect activity to kick off the feeling of the Holiday season! This was our first visit the The Empress Theatre. I have been hearing how amazing it is for some time now, and when I saw that they were performing a musical based on one of my favorite books, The Christmas Box by Richard Paul Evans, I had to get my tickets right away! The Empress Theatre is located in Magna, UT, and is really easy to find. It's in the historic section of Magna on Main Street. Because it's a smaller theatre, parking is easy to find. When we walked in, I immediately noticed the price of their concessions. They did not cost an arm and a leg, which was much appreciated! Usually we spend $30+ just on treats when we attend a performance or a movie, and for all four of us to each get a drink and a treat, the grand total came to $11. That alone is enough to return! The theatre seats are laid out so that the stage is in the middle, and the seats are around it. Any seat is a good seat at The Empress Theatre. The dress is casual, which makes it easy with two young children! The play follows along with the book, with a few extra additions that the writer, David R. Naylor, added in. The songs are perfect for the content of the story, and it's fun to see how they do the dream sequences. That way my 9 year old daughter's favorite part. David R. Naylor wrote the music, lyrics and script. At the end, we were all in tears, so make sure you bring tissues! The girl who played Jenna stole the show, and the girl that played the angel was breathtaking! This is one event you are not going to want to miss this Holiday season, so make sure you get your tickets as soon as possible! It's the perfect family activity to get you in the Christmas spirit, and will set the tone for the rest of the holiday season. The Christmas Box is playing at The Empress Theatre on Mondays, Fridays and Saturdays through December 22nd. Like them on Facebook for special deals!